Special Notice as of June 11, 2004: Access to Strathcona Park via the Ash River Road may be restricted until further notice. Logging operations on adjacent private land has required the road to be closed for public safety reasons. School groups planning to hike in Strathcona Park are asked to register with the Vancouver Island Region. Della Falls: Length 16 km. Suggested hiking time: 7 hours. Elevation change: 350 metres. The trail starts at the west end of Great Central Lake and follows the old railway grade up the Drinkwater Valley to near the base of Della Falls. Access to this trail is by boat or canoe from the eastern end of Great Central Lake, northwest of Port Alberni. Travel time by powerboat is about 45 minutes, or one day if canoeing. Paddlers should be aware that this area is subject to high winds and should exercise caution when crossing the lake. Access to the trailhead via float plane is also an option. The notable features of this hike include Della Falls, which at 440 metres is one of the 10 highest waterfalls in the world. Also of interest are historic sites from the early days of logging and mining. This trail also provides access to Love Lake and Della Lake. Note: handrails are removed for the winter season on the narrow bridge over the Drinkwater River (12.5 km from the trailhead). Love Lake: Length 4 km. Suggested hiking time: 2 hours. Elevation change: 830 metres. The trail starts from the Della Falls Trail at the 15 km mark and ascends to Love Lake. Good observation points of Della Falls are offered en route. Gold Lake: Length 5 km. Suggested hiking time: 2.5 hours. Elevation change is minimal. NOTE: As of 2016 the trailhead is no longer accessible by vehicle. The Bridge at Gisle Creek has been removed. If the water is low enough to cross by foot, the road to the trailhead (approximately 8km) can still be hiked. Length 9 km. Suggested hiking time: 5 hours to ridge. Elevation change: 1,600 metres. Follow Comox Lake logging road to Cruickshank Canyon, continuing along the spur toward Comox Creek until the road ends where the bridge has been removed. Park here and follow the road on foot for 2-3 km. A sign on the right hand side of the road marks the start of the trail. The trail climbs for approximately 1,000 metres before you reach the park boundary, then continues to climb to the ridge, where there are a number of camping locations. From the ridge, the glacier is approximately a one day return trip. Water is scarce; be sure to bring all that you require. 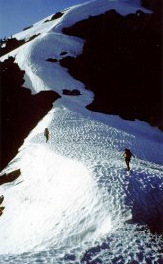 This steep trail and alpine route is not maintained and is suitable only for advanced hikers and mountaineers. Road access to this trail follows active logging roads; these may be closed to the public during work hours. The chance of encountering loaded logging trucks while traveling these roads is highly likely. Logging trucks have the right of way at all times. Drivers should use caution and yield to logging trucks; use pullouts whenever possible. Backcountry road maps are also a good idea. Tennent Lake-Mount Myra: Length 7 km. Suggested hiking time: 5 hours. Elevation change: 1,500 metres. This trail starts just past the Boliden-Westmin mine at Strathcona-Westmin Park and follows a gravel road for 900 metres. The trail then leaves the road beside the pump house and follows a very steep, older roadbed to Tennent Lake. A route exists from Tennent Lake to Mount Myra. Lady Falls: Length 900 metres. Suggested time: 20 minutes. This trail starts at Highway 28 and follows through old-growth forest of cedar, Douglas fir and hemlock. A viewing platform offers great views of Lady Falls. Elk River Viewpoint: Length 400 metres. Suggested time: 10 minutes. This trail starts at Highway 28 and follows along the BC Hydro power line. A viewing platform provides views across the Elk River and toward Roosevelt elk habitat. Interpretive signs at the trailhead and viewing platform educate visitors about Strathcona’s Roosevelt Elk. Lupin Falls: Length 800 metres. Suggested time: 20 minutes. The trail to Lupin Falls starts from the Buttle Lake/Westmin Mines Road. This is a short, loop trail through a cool old-growth forest featuring unique saprophytes that include Indian Pipe, Candystick and Pine Drops. Great views of Lupin Falls can be had from a viewing area, complete with a park bench. Auger Point: This trail starts off at the Buttle Lake/Westmin Mines Road. This five-minute loop leads through an old-growth Douglas fir forest that was devastated by forest fire in the mid-1980s. This trail provides views of nature as it reclaims and “greens up” the burnt-over landscape. Karst Creek: Length 2 km. Suggested time: 45 minutes. This trail starts off at the Buttle Lake/Westmin Mines Road and passes by a limestone area that includes sinkholes, disappearing streams and a waterfall. Wild Ginger: This 15-minute loop trail through old-growth forest begins across from the Ralph River campground. Large patches of wild ginger and a wide range of forest flowers abound along this trail. Shepherd Creek: Length 1.5 km. Suggested time: 45 minutes. This loop trail begins across from the Ralph River campground and travels through a mix of open forest and marshy areas with minimal elevation change. Lower Myra Falls: Length 1 km. Suggested walking time: 15 minutes. The trail starts near the south end of Buttle Lake before the Nyrstar-Westmin mine site. This trail has one steep section. There are views of several beautiful cascades from a viewing platform at Myra Falls, as well as access to several creek side areas. Please exercise CAUTION when visiting the falls.